Workshops will include discussion and hands-on activities related to the history and heritage of the cultures that have influenced the Arizona-Sonora region: the Tohono O’odham; Mexican culture; Pioneers including European, Jewish and Mormon settlers; Chinese and African Americans. Workshops also will discuss the origins, evolution of area industries such as farming and mining and their impacts on the region’s growth. Additional activities include horseback rides and Old Tucson’s signature entertainment. A special one-day session touching on these subjects will be held on Monday, June 15 for campers from the Tucson Jewish Community Center. The Arizona Sonora Western Heritage Foundation is a nonprofit organization. The Foundation in cooperation with Old Tucson Company will expand Old Tucson into a multi-cultural Western heritage center. 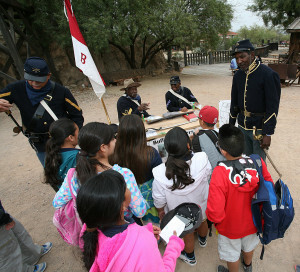 With expertise and support from a community of partners including the University of Arizona, Pima County and local cultural organizations and groups, the center will provide interactive living history and educational programs that encourage a deeper appreciation for the complex history and diverse cultures of Southern Arizona and Northern Mexico. Old Tucson is Southern Arizona’s premier film location and Hollywood’s most famous Western movie location recognized in over 300 feature films and TV Westerns. For more information about Old Tucson, visit www.OldTucson.com/events or call (520) 883-0100. Old Tucson is located in Tucson Mountain Park at 201 S. Kinney Road, Tucson, AZ. This entry was posted in Home Page, Home Page Slider, News and tagged Old Tucson. Bookmark the permalink.